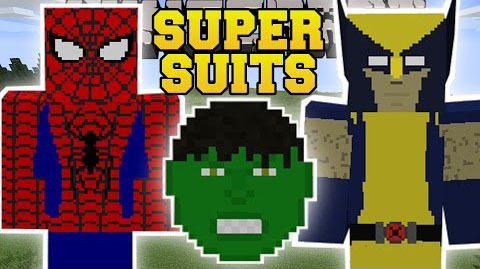 SuperHuman (Super Suits) Mod will add some fun to the game by adding armor sets for different superheroes, each of them has unique abilities which will probably makes you laugh while playing. None of the suits or items are craftable. Instead, as you kill mobs, they will drop points that are collected similar to experience. In the future, these points will be used to “purchase” costumes. In addition to points, mobs will also drop Blind Bags. When right-clicked, the bag is opened and a random armor piece is dropped. This is inspired by collectible card games where early on you will get mostly unique pieces but the more you get the harder it is to find the pieces you actually need. This is intended to promote trading with friends as is the case with CCGs. Additionally, there will be a block (it’s in right now but it isn’t craftable) that can consume your extra armor pieces and turn them into points. Ms. Marvel – Ms. Marvel has Regeneration 2 when not transformed. She also has Strength 5. Pressing F will make her fist grow which increases her Strength level to Strength 10. Pressing R will use her shape-shifting ability to turn into a couch. I know this is silly but it is the only thing she has turned into in the comics so far (that I can remember, at least). This is not Carol Danvers but rather Kamala Khan. Carol Danvers is called Captain Marvel now. Wolverine – Wolverine has Swiftness 1, Strength 10, Jump Boost 2, and Regeneration 4. Pressing F will toggle his claws. When his claws are out his Strength is increased to Strength 20. Holding an item while his claws are extended will cause his claws to retract. Spider-Man – Spider-Man has Swiftness 3, Strength 15, and Jump Boost 8. With a Web Shooter equipped in the first Baubles ring slot, Spider-Man can shoot web. He can climb walls by simply walking into them as if they were ladders. Holding sneak will also allow Spider-Man to stay in place against a wall. Spider-Man has a costume change ability. Pressing 1 on the number pad will cycle through his 10 different costumes. The costumes are Symbiote (Black suit), Big Time, Sensational, Future Foundation, Iron Spider, Classic, Superior, Scarlet (Rilley), and Scarlet (Kaine). When wearing the Symbiote or Iron Spider suits, Spider-Man’s Strength level is increased to Strength 20. Also, while wearing the Iron Spider suit, Spider-Man gains Resistance 1 and can glide by sneaking while in the air. Spider-Man also has a Spider-Sense that is displayed when hostile mobs are nearby. Nightcrawler – Nightcrawler has Swiftness 1 Strength 5, and Jump Boost 2. He can climb walls by simply walking into them as if they were ladders. Holding sneak will also allow Nightcrawler to stay in place against a wall. Pressing F while looking at a block that has air space above it (within 64 blocks) will teleport Nightcrawler to that place. Pressing R will spawn in Nightcrawler’s sword. You must have the first hotbar slot selected and when you deselect that slot the weapon will disappear. Hulk – Hulk has Swiftness 3, Strength 25, Jump Boost 4, Regeneration 4, Resistance 4, Fire Resistance, Health Boost 7, and Step Assist. Pressing F will cause a “Thunder Clap” which damages nearby entities. Holding the sneak button while in the air will cause a “Ground Pound” which damages nearby entities on impact. Pressing R will toggle Hulk’s “Super Jump. When active, jumping will propel the Hulk forward and into the air. Running will increase the distance traveled..
Storm – Storm has Strength 5 and Flight. When falling, after a short distance, the fall is slowed. Pressing F while looking at a block will cause a lightning strike. Pressing R will cause it to rain with a chance of a thunder storm. Pressing G will clear the weather. Daredevil – Daredevil has Strength 5 and Jump Boost 2. He is immune to fall damage. When pressed against a wall, while holding the sneak button, he will slide down the wall slowly. Pressing F will spawn in his Billy Club. You must have the first hotbar slot selected and when you deselect that slot the weapon will disappear. The Billy Club has two modes that can be switched by sneaking and right-clicking. The Short Mode is weaker but has a chance of stunning whatever is hit. The Long Mode does more damage. When his mask is worn, there is an overlay to simulate his sonar vision. This can be turned off in the config. Martian Manhunter – Martian Manhunter has Swiftness 3, Strength 25, Regeneration 4, Resistance 4, Health Boost 5, and Flight. He flies faster than normal creative flight. Pressing F will toggle Invisibility. Pressing R will give Intangibility for 10 seconds. Pressing G will fire his Martian Vision. The Flash – The Flash has Swiftness 3, Haste 5, Strength 5, Jump Boost 2, Regeneration 1, and Step Assist. Pressing F will toggle The Flash’s speed. At stage 1 he has Swiftness 25 and Water Skimming (can run across water). At stage 2 he has Swiftness 50 and Water Skimming. Also, jumping onto a wall while running will allow him to run up the wall. At stage 3 he has Swiftness 99 and Water Skimming. Also, jumping onto a wall while running will allow him to run up the wall. The Flash’s Costume Ring is also available. It can be worn in the first Baubles ring slot. While it is equipped you can sneak and press R to put the suit on or take it off. You must collect the suit first and have it equipped to store it. I also know that this resets the damage on the armor but I am moving toward the suits not taking damage anyway so this isn’t a big deal to me. Deathstroke – Deathstroke has Swiftness 1, Haste 3, Strength 15, Jump Boost 2, Regeneration 1, and Resistance 1. Pressing F will spawn in his Bo Staff. You must have the first hotbar slot selected and when you deselect that slot the weapon will disappear. Right-clicking with the Bo Staff will fire a projectile. Pressing R will spawn Deathstroke’s Broad Sword. You must have the first hotbar slot selected and when you deselect that slot the weapon will disappear. You can easily switch between his Bo and Sword. Pressing G will have a chance of giving Slowness, Mining Fatigue or Weakness to nearby entities. Pressing 1 on the number pad will remove Deathstroke’s mask. When his mask is off, he loses his Resistance. Harley Quinn – Harley Quinn has Swiftness 1, Strength 10, Jump Boost 3, and Regeneration 2. She is immune to poison. Pressing F will spawn in her Mallet. You must have the first hotbar slot selected and when you deselect that slot the weapon will disappear. Wonder Woman – Wonder Woman has Swiftness 3, Strength 25, Jump Boost 2, Regeneration 1, Resistance 4, Health Boost 5, and Flight. She flies faster than normal creative flight. Pressing F will spawn in her Sword. You must have the first hotbar slot selected and when you deselect that slot the weapon will disappear. Pressing R will toggle her Rage Mode. When rage is active, he Swiftness is raised to Swiftness 5 and her Strength is raised to Strength 28. Were Lasso of Truth can be seen on her costume but it is not usable because a rope that makes people tell the truth isn’t very practical in Minecraft. Booster Gold – Booster Gold has Swiftness 1, Strength 15, Jump Boost 2, and Resistance 2. Pressing F will fire a Force Bolt that does damage and has some knockback. His Legion Flight Ring is also available. It, as the name might imply, grants the wearer Flight. Blue Beetle – Blue Beetle has Strength 5 and Jump Boost 2. Pressing F will spawn in his BB Gun. You must have the first hotbar slot selected and when you deselect that slot the weapon will disappear. The BB Gun has two modes that can be switched by sneaking and right-clicking. The first mode is Air Blast mode. This fires a projectile that is mostly harmless but has really strong knockback. The second mode is Flare mode. This fires a projectile that doesn’t do any damage but causes a special kind of blindness for 5 seconds to whatever it hits. Download and install Baubles Mod.